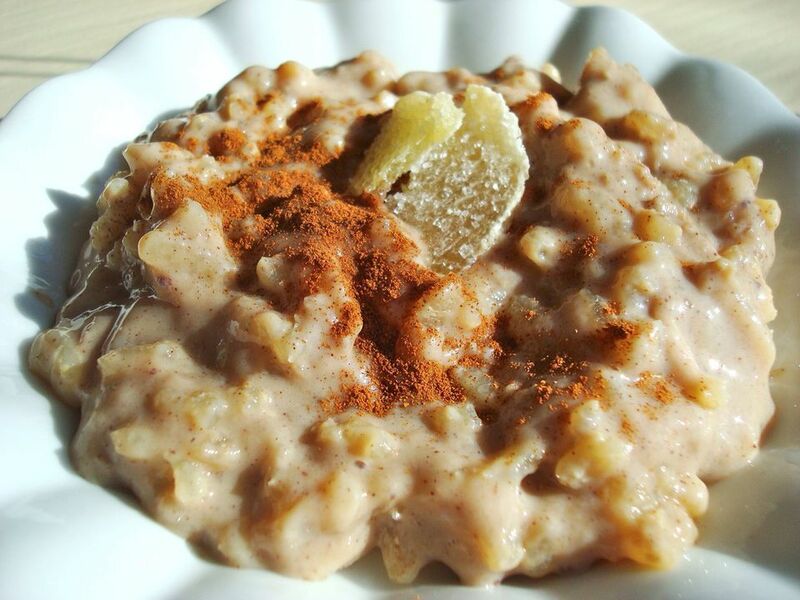 Simple and soothing, rice pudding is one of the ultimate comfort foods. But most recipes include eggs and dairy, including milk or cream, and sometimes butter. That makes it off limits for vegans, many folks with food allergies, and kosher keepers who've recently eaten meat. (See "Did You Know?," below). But this egg-free, non-dairy version -- spiced with warming cinnamon and ginger, and sweetened with pure maple syrup -- relies on Arborio rice to boost its creaminess. Enjoy it as a humble dessert or snack, or top it with fruit and nuts for a special breakfast treat. Ingredient Tips: Make sure you use real maple syrup for this recipe, rather than pancake syrup. I like to use a Dark Amber syrup (sometimes labeled Grade B) for its deep, rich maple flavor. Why use Arborio rice? It's short starchy grains plumps up beautifully and imparts a nice creamy texture to the pudding. Did You Know? The kosher prohibition against mixing milk and meat extends beyond a single dish or meal, with a waiting period between meat meals or snacks and subsequent dairy consumption. The length of this waiting period varies according to community custom, with Dutch Jews waiting as little as one hour, and some Ashkenazic Jews (those of Eastern European descent) waiting 3 hours. Still others, including most Sephardim, wait six hours. Interestingly, kosher observers who've just eaten dairy can generally eat meat afterwards, without a lengthy waiting period. Hard aged cheeses pose an exception to the rule, but most observe a shorter wait than the one after meat. Combine the rice, soy milk, maple syrup, cinnamon, and ginger in a large, heavy-bottomed saucepan. Bring to a boil, then reduce heat to low and simmer uncovered, stirring occasionally, until the rice is tender and creamy, and most of the liquid has been absorbed, about 35 to 40 minutes. Divide the pudding evenly among 6 heatproof dessert dishes, and allow to cool slightly. (The pudding will thicken as it cools.) Serve warm, or cover each dish with plastic wrap and refrigerate. If desired, dust the pudding with additional cinnamon and garnish with crystallized ginger before serving.